A Houseboat cruise along the backwaters is really an amazing experience for every traveler to Kumarakom. 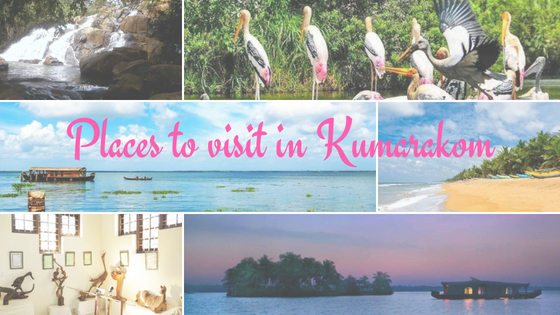 Kumarakom is not only for houseboat cruising, here is a small list of places to visit in Kumarakom. Kumarakom Backwaters : Kumarakom is the most enchanting backwater destination in Kerala. Kumarakom backwater cruises are a unique experience which leaves memories for lifetime. Kumarakom is the most famous Kerala backwaters destination for houseboat rides and it is among the most popular Kumarakom tourist places. The houseboat take visitors through the canals, lagoons, lakes, river and backwaters in the region. The major sightseeing option at Kumarakom is houseboat cruise in backwaters of Vembanad. Tourists can get a beautiful view from the deck of the houseboat of the Kumarakom Backwaters. Kumarakom Bird Sanctuary : Kumarakom Bird Sanctuary is a paradise for bird lovers, It is close to the scenic backwaters. This sanctuary is spread across 14 acres and was established by the Government of India for preserving coconut trees and mandrakes, which are the natural habitat of birds. Visit the greeny Kumarakom Bird Sanctuary to get acquainted with various migratory birds including Siberian Stork and Kingfisher. By hiring houseboats and motorboats on the Vembanad Lake you can enjoy bird watching. The best time for going boat cruises and enjoy bird watching is during dawn and dusk. Vembanad Lake : Vembanad lake is the longest lake in India and largest lake in Kerala and one of the best Kumarakom tourist spot. Apart from Kumarakom sightseeing, the lake also allows outdoor activities like boating and fishing. Vembanad lake is also known by the name Punnamada lake. Snake boat race is the main festival that tourist from many countries visits to enjoy. Nehru Trophy Boat race takes place in the mesmerizing Vembanad lake in the month of August. Pathiramanal Island : Pathiramanal is at a distance of 12 kms from Kumarakom. Pathiramanal Island (means – Sands of Night) is small & beautiful island in Vembanad Lake. The island is set in the Vembanad Lake and is accessible only via boat. The island is spread over an area of 10 acres and offers an opportunity to watch rare migratory birds from different parts of the world. Pathiramanal is one among the most calm tourist places in Kerala. Aruvikkuzhi Waterfalls : The Aruvikkuzhi waterfall cascades from the height of 100 feet which enchant tourists who come here from different places. The rocky region and lush green vegetations make this place a famous picnic spot where tourists can enjoy pleasurable time amidst scenic nature. Bay Island Drift Museum : Bay Island Driftwood Museum is one of the popular museums in the Kumarakom region, which has a unique collection of driftwood articles. The museum is one of its kind and is quite popular for using advanced contemporary art techniques in order to design different kinds of tree-trunk as well as root sculptures. Kumarakom Beach : The picturesque surrounding of the Kumarakom beach attracts huge number of tourists from all parts of the world. The beach gives a peaceful and relaxed experience and is well-facilitated with all basic requirements like spacious resorts, shopping complexes and restaurants. Beach is one of the best Kumarakom tourist spot.